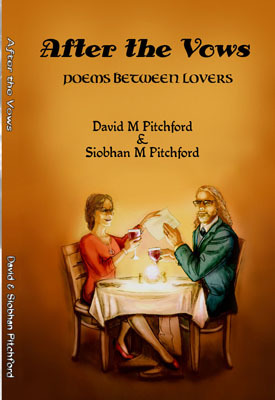 After the Vows: Poems Between Lovers is a fantastic collection of 120+ sonnets – wonderfully diverse poems on a broad range of topics – by David M Pitchford and Siobhan. This collection shows the early and developing life of a relationship between two highly articulate people. It’s a great read, especially for Romantics who need a model for practical romance or for cynics who need the same. a kiss from your lips, in a smile or pout. and when I look in your eyes, I see me. or song, Orpheus ever thought to play. therefore so much the more desirable. she I wonder of-you I worldly hold. promised future – parting, we wave kisses. and you smile a laugh in my direction. the surface whenever you are near me. arms around you for one more garlic kiss.